The Old Stone House gardens, located in Washington Park, are open for visits from dawn to dusk. Designed in 2004 and evolvingÂ with useÂ and park improvements: a historically referencedÂ public landscape has been created by applying sustainable (permaculture) designÂ principlesÂ to both Washington Park and MS 51. We continue to respond to community needs as they become apparent and incorporate those into our often visited and well-used garden areas. The gardens are co-designed with our community and volunteers are invited to connect with us. Volunteers and students do most of the installation, hardscaping and weeding, in exchange for learning, health benefits, harvest and community connection. Our gardens are Â social interaction centers as much as they are food, medicine and craft resources, or giant sponges to soak up rainwater. The Partnership Gardens program between MS 51 and The Old Stone House began in 2005. Â Over 600 students flood into the Park during lunch hour and we focussed on them in our community stewardship plan.Â Jody Reiss, a science teacher at MS 51 planted a memorial garden with students and parents in response to 9/11. 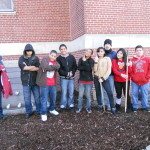 Â An after-school garden club cared for the space and was interested in planting more of the schoolyard. Â Claudia Joseph joined them and the gardens grew. Â A Con Ed Green grant Â allowed for classroom education sessions and the purchase of perennial plant material that began the foundation of our History and Habitat gardens. 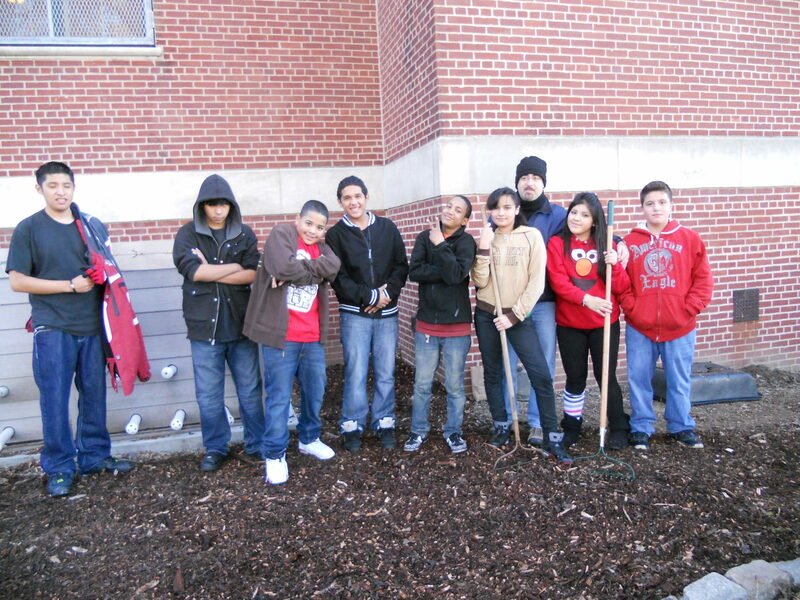 In 2005,Â the special education students of Mitchell Porcelan and Joe Valentin came to the garden to help in all aspects of garden construction, planning and planting. Â We found that their 2 hours class period was a good framework for completing projects. Â The students responded with enthusiasm and learning took place on many levels:Â science, history and community care were woven into the field activities. 2001Â First garden planted in response to 911 on the north side of the school by the entry – Â daffodil bulbs were also planted in the park. 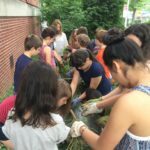 Science teacherÂ Jody Reiss installedÂ the ornamental and memorial gardens, and maintainedÂ them during after school garden club with students.Â Principal Castelli broughtÂ in forsythia cuttings to form what is now the huge hedge. 2005Â ColonialÂ gardens based on the principle of a useful landscape installed at OSH. 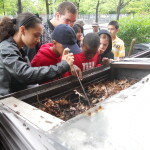 2007 New “History & Habitat Gardens” installed – 10 classroom visits by Claudia pump the gardening program and students response is overwhelming.Â A grant from Con Edison underwrites purchase of plant material and classroomÂ education. 2007 and 2008 after school gardening with Jody Reiss, Claudia lends support. Â We hold “It’s My Park/It’s My School” events parents donate plants and Jody holds book sales to raise money.Â At this point, the students are literally tearing the Park apart cobble by cobble and leaving tons of trash behind after lunch. 2008 Â Mitchell Porcelan and Joe Valentin bring their special education classes to the gardens. Their participation creates a new level of stewardship and strengthens the partnership between the School and Park. The Celebrate Urban Birds program with CornellÂ reveals that our resident birds are sparrows, starlings and pigeons. 2009 Freddie Valandre brings 3 sets of combined Social Studies and Science classes to gardens for 10 sessions each.Â A huge Science Fair project educates people about our gardens as a result. Â Students care for gardens at OSH and School, plant bulbs learn about herbs and help in other ways. They produce a Â Science Fair exhibit focussed on community stewardship.Â Â Mr Porcelan and Mr Valentin continue to support the gardens by bringing classes to work in both the Park and the School gardens. Â Permaculture students (taught by Claudia Joseph) participate in care of the gardens this summer and every year after. Electrical work along the fence disrupts plantings of native berry yielding shrubs on the west end of the school.Â Also in 2009, The Old Stone House partnered with Brooklyn Botanic Garden’s Compost Program and master composter Jon Pope led a group of volunteers to build three industrial sized, rodent proof bins at the School.Â OSH paidÂ for the concrete slab under the bins ($1,000) and we held the first Compost-O-Rama, Claudia Joseph originated the Pumpkin and Leaf Reclaiming Project to address organic waste that occurs every autumn. Â Turning waste to benefit through the compost process is a cornerstone of every healthy garden. Â We collected over 100 pumpkins, combined them with shredded leaves from our site and filled one bin. Â The second bin was filled with garden waste from the School. Â The third bin was filled with waste from Rose Water restaurant and comparison of the three bins became a science fair project. Â Special thanks to John Tucker for bringing that material to our site! 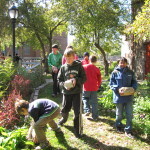 The garden education program continuedÂ in 2010 and 2011 with more classes and more schools participating. Chef Edward of Pizza by Cerce started bringing waste from his restaurant and we found that the coffee grounds from Cafe Martin across the street were a big boost to the system. Â 2010 Â Beth Eloheim participatedÂ in an afterschool program for 10 session with 7 – 11 year olds who help re-plant gardens cleared by MS 51 students. A new cable line at MS 51 disruptedÂ the east end of the History and Habitat gardens: valuable plant material was lost.Â Al Medina sentÂ classes to help transform ParkÂ gardens into diverse History & Habitat spaces.Â Â The OSH Dutch gardens are transformed from 3 kinds of plants toÂ diverse perennial and annual plantings through their combined efforts withÂ MS 51 students. 2011 The playground on the east side of the House is under construction. Â Twelve new boxes are added to the west side of the house by a Green Jobs training program and are used by the Garden Explorers. Some gardens are bulldozed and others are improved. Â The pedestrian corridor to 4th Ave. is planted. 2012 Jody Reiss brings 4 classes to the garden for tours on the colonial uses of plants and we have a great time. Several other teachers want to visit with students but testing interferes and then expansion of the Park is the main event this year. Â Two new gardens are created and Mr. Valentin’s classes save the day by helping us chip the paths before the ribbon cutting. Â Students offer to help in the gardens after school and at lunch. Â The Garden Explorers program is growing. More butterflies than ever use the garden as host. Â More birds visit: black throated blue warbler, thrush, other warblers, cat bird. The Caregiver-Toddler program runs on 10 Thursdays to help connect toddlers and caregivers to the gardens. MS 51 sends students to OSH afterschool for an 8 part gardening program.Â 2012 The playground reopens in May and gardens go up instantlyÂ out frontÂ on either side of the House with help from the Permaculture Training class participants. Â Edging finally arrives in September and MS 51 students come to the rescue andÂ help put it in place. Â Many volunteers assist the gardens.Â Construction is finished in all garden areas, finally FallÂ 2012 ! Superstorm Sandy damages some plant material and necessitates clean-up. 2013 Gardens are re-installed in bulldozed areas. Rodents that migrated after Superstorm Sandy become garden pests. Efforts to eliminate them ensue. The school gets a new concrete pad and new rodent proof dumpsters which helpes to alleviate the problem. 2014 Cataloging and classes are planned in the gardens. Science Fair will be displaying insects from the bins and talking about why we compost. Mr. Sandman has student measure percolation rates of the tree areas on 4th St. Â The memorial garden needs a facelift and we are discussing pollinator plants. 2015 We worked with Mr Sandman’s 6th grade Science class. Students helped care for the tree arreas and mulch the garden pathways. Mitch Porcelan brought his classes for plant study. Jon Levinson is interested in the historic information in the gardens. All of the classes are studying pollinator plants. Milkweed plants itself in the memorial garden as well as aster, goldenrod, echinacea andÂ phlox – all good for bees and butterflies. Butterfly counts have risen from zero to nine different species. Migrating birds as well as resident Hawks, Mockingbirds, Catbirds and Robins are now seen in the Park and School yard. Jody Reiss brought classes in the spring to clean grass from the pollinator garden in Washington Park and plant wildflower seeds. We plant crab-apple trees in the pedestrian corridor and at the skate-boarding area of the Park. 2016 Mr. Sandman brought classes to the school gardens to clean and weed in May. Students made new compost and harvested finished compost from finished bins.Â A terrible drought year, the gardens are tested and survive. Water is shut off at the front of the school for the whole summer.Â Now that we are rodent-free, new programs are designed to utilize the gardens. 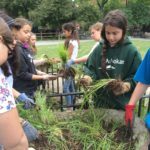 A partnership with Gowanus Canal Conservency invigorates support for work days andÂ after-school programming is being planned for 2017. Â October garden clean-up days restore gardens by removing too-large shrubs and planting chrysanthemums and bulbs. 2017Â Kate Connolly’s classes have used the gardens all spring during Spanish class. Anna Pleskova gave extra credit and 55 student and family members showed up for a joint project with Gowanus Canal Conservency to chip every tree area in Washington Park and across 4th St at MS 51. A special Science Bridge program the first week of September utilizes the compost system and studies the diversity of plants and other living things at the Park and School. Grapes and Black-capped Raspberries ripen in the schoolyard. The pollinator garden is full of Milkweed, Asters, Goldenrod and Rudbeckia; honeybees and butterflies are taking advantage of the banquet. Fall 2017 The gardens received a makeover with a dramatic removal of the original Forsythia hedge and the addition of ‘Winter’s Gold’ winterberry – a native shrub that supports birds. “The Big Clip” also reshaped the Yews at the back of the Memorial/Pollinator Garden and kicked off our neighborhood Compost Club registration. Thirty-five students participated and would not leave until the hedge was gone! The material was sorted with leaves and soft twigs going into the compost bin. The sturdier material was used to create edge fencing in the Shade garden at OSH. Woven in the wattle tradition, this fence wil protect the plants from foot-traffic.